Hello everyone! 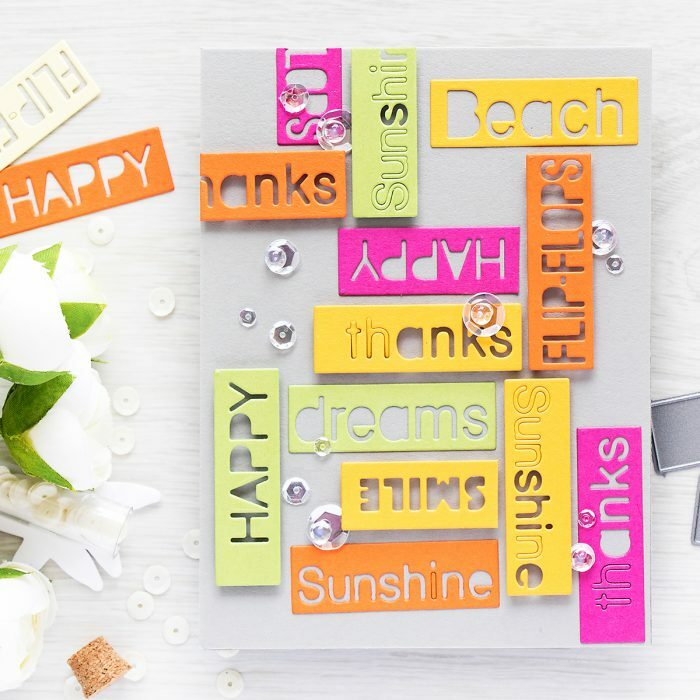 As I was working on a card and video tutorial the other day (I plan to share it soon so stay tuned) I grabbed my Simon’s Summer Greetings dies and was inspired to create a card with a bunch of colorful die cut blocks. I think Shari Carroll shared a similar card design a few years back but in more pastel or muted colors, I couldn’t find the actual card to link to, but I think she might have inspired me with her project to create this card. I started by die cutting a bunch of word blocks out of some left over pieces of colored cardstock (I’m linking to exact colors I used below) I had sitting on my desk. I die cut each one about 3-4 times, I made sure to use different colors of card to have a nice variety for my background. I first planned to have the entire background filled with these blocks and I wanted to use sticky adhesive sheets to adhere them (and not have any dimension). But as I started laying the die cuts onto a light gray card base I decided to only create a partially covered background and to foam mount a few of these for a pop of dimension. I kept the positive die cut letters in some of the die cuts to mix things up a bit. I know some people cant stand this, but I actually don’t mind having the die cut pieces in there. It doesn’t bother me. Of course I couldn’t resist adding lots of clear sequins and drops from Pretty Pink Posh, they just make everything look so sparkly! While this card doesn’t have a one main sentiment I think its a fun one that works for many different occasions. More importantly – its a bright and cheerful one and I hope will bring a smile to person who is going to receive it. Make a light gray A2 top folding card base. Die cut a number of word blocks using Summer Greetings dies and colored cardstock (doll pink, green apple, sunshine and orange peel from Simon Says Stamp). 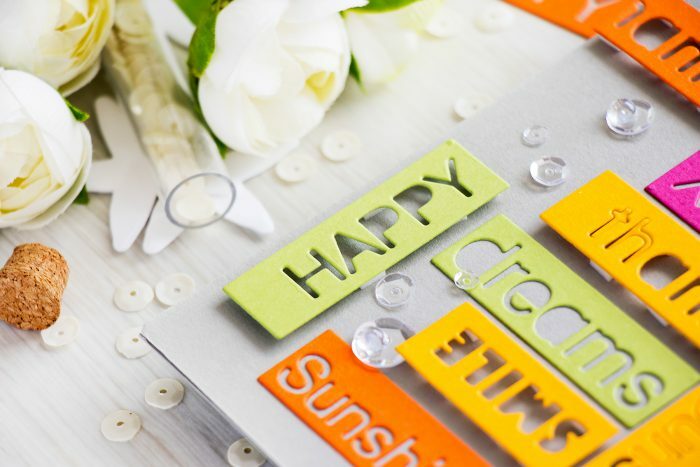 Arrange die cuts on a card base to create a partial background. Trim some if needed. Adhere some of the die cuts with the help of foam adhesive and some using glue. Embellish the card by using sequins and drops in a neutral color. Such a cool card, love those dies. Such a great design! Love combination of gray background with all these bright elements. Cool!